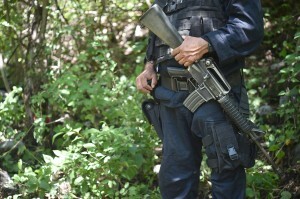 Four new mass graves were unveiled Thursday in the southwest Mexican town of Iguala, two weeks after a group of 43 students vanished in the region. The discovery brings the total number of burial pits discovered to 10. The body count has not yet been updated, but stood at 28 over the weekend, when six pits of charred human remains were unearthed. DNA samples will be run for identification, but it is presumed the carcasses belong to a group of 43 missing students who clashed with police at a protest September 26th. Prosecutors claim the young men were last seen being rounded up by local authorities, who then handed them over to a drug gang. Since the event, 34 people have been detained on suspicion of involvement — including 26 local police officers. Most of the students came from remote mountainous towns in the state of Guerrero, a notoriously volatile and gang-ridden area of Mexico. The country’s Attorney General, Jesus Murillo, said Thursday the motive behind the apparent massacre is unclear. He has ordered a formal hunt for fugitive Iguala mayor Jose Luis Abarca, his wife and the local head of security. Prosecutors claim they had deep ties to the suspected drug gang. Abarca is currently protected by political immunity under Mexican law, but Guerrero head prosecutor, Inaky Blanco, is asking for the state’s congress to disregard the layer of protection.